What would Danny Meyer Do? It is impossible to manage a restaurant anywhere in the United states without the name of Danny Meyer coming up at some point. His name is tossed around in restaurant management meetings on a regular basis. Snippets of his book “Setting the Table” are passed around as internal memos. Most every restaurant I have worked in has, at some point, adopted his five tier approach to operations ( to paraphrase: “first we take care of our staff, second our guests, third our community, fourth our suppliers, fifth our bottom line” ). Mr. Meyer has become an icon in the Hospitality world along the same lines as Chuck Norris has to the rest of the world. Every Chuck Norris Fact (“There is no such thing as evolution, only animals Chuck Norris allows to live”) could easily become a Danny Meyer Fact (“There’s no such thing as good and bad restaurants, only restaurants Danny Meyer allows to live” or “The shortest distance between point A and point B is whichever way Danny Meyer chooses to go”). In restaurant nerd meetings, anytime you can mention Danny Meyer’s name in conjunction with some new policy you are proposing, it is an automatic benediction. So, maybe I held off reading his book because I felt so marinated in his philosophies already. Maybe I realized that all the things done in his name cannot possibly be true. So I buckled. 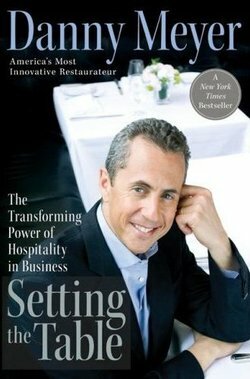 I finally checked Setting the Table by Danny Meyer out of the Los Angeles Public Library. Not surprisingly, a lot of his philosophies make sense. · In business opportunities, what you say “no” to is just important as what you say “yes” to. · Mistakes are going to happen, so prepare to deal with them gracefully. All of these are incredibly applicable to everyday restaurant operations. And it’s nice to see that one of the Greats in the industry today dealt with his fair share of hard knocks on his journey toward the top. But some of the writing…..I just find myself wondering where his ghostwriter was half the time. If I read one more line that began “Who wrote the rule that….” I would throw the book across the room. Yeesh. Nobody did. Nobody wrote those rules. I think what you’re trying to say is “question everything, even given circumstances.” So please just say that. Mr. Meyer also tends to gloss over some challenging situations that could have educational potential. A chef that he sends to France for a year of study and preparation for a new restaurant, later drops out of the project just before the restaurant opening. The general manager selected for The Modern leaves just two weeks before the doors open. Mr. Meyer only address these happenings with the platitude that it was a “mutual agreement” that this was “not a right fit.” Which is gracious, sure, but it screams that there is more to the story. If the fit were so wrong, wouldn’t it have been clear earlier? Why would anyone just decide to stop working with one of the most successful restaurateurs in the modern era, especially after he had paid for a year-long trip to France? Something juicy is definitely missing. Maybe I’m an addict for the dramatic, but I’d love to read that book. All in all though, I know from working in the industry how difficult it is to put theory into practice. Any human endeavor is fraught with the potential for chaos. If Danny Meyer can build systems that bring his philosophies to life in his restaurants, then he definitely has my respect as a restaurateur. His approach to ‘Enlightened Hospitality’ is also inspiring and energizing. And now that I’ve read his book, I’m better prepared to bulk up my arguments in management meetings with chapter and verse citiations…..
Posted in Danny Meyer, Restaurant 101, Setting the Table, WWDMD? >omg! this book is on my night stand right now! i have this urge to read it but for some odd reason, i don't "want" to. i look at it every day and wonder why not. but i am now inspired to read it and hopefully be able to share some important points with my staff. 😉 have you ever read the book "hug your customers" by jack mitchell? that's a good one too! ❤ miss you!